I'm making a quick dash into the playground with a card using some snippets of patterned paper before I go and sit by the fire again. It is a beautiful sunny morning but goodness me it has turned very chilly again in the last few days and we've even been threatened with snow. I have quite a few stamps which are suitable for paper piecing techniques and what a great way of using up even the tiniest of scraps which we can't bear to throw away. I started with a fairly large snippet of watercolour paper which had been coloured using Pixie Powders from which I die cut a square. The flower stamp was first stamped onto this background and then again onto snippets of three different patterned paper scraps which were then carefully cut out using scissors before sticking them over the stamped image. The sentiment was stamped onto the background using the Misti stamp platform - such a great invention these platforms!! Sentiment - stamp from my stash probably a freebie. what a very lovely card and that background is brilliantly created. What a great use of snippets also. 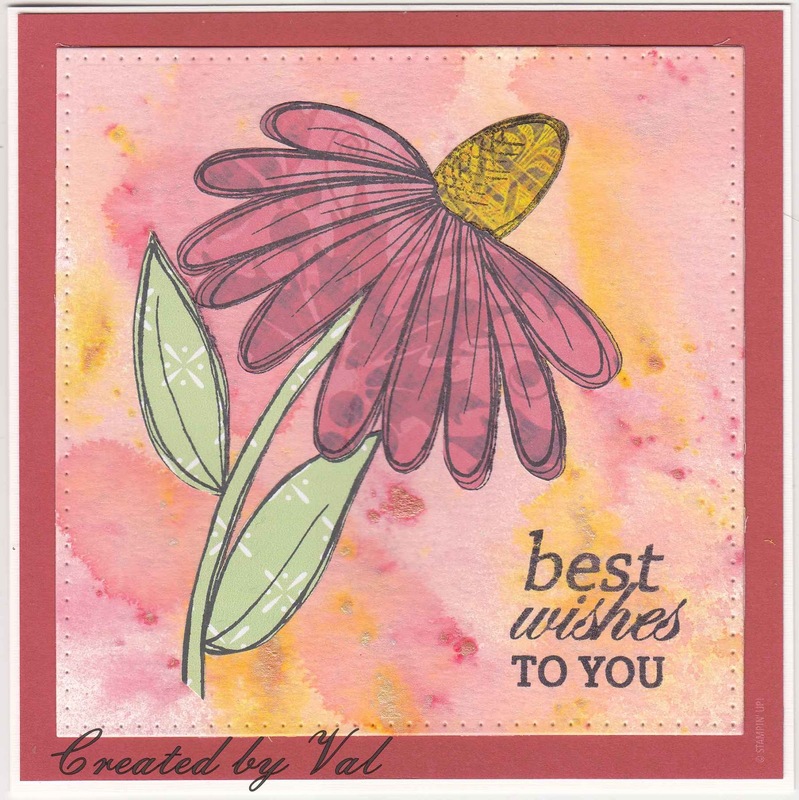 Lovely card Val - I adore cone flowers and your paper piecing really sets this one off a treat! Super background as well - I need to get my Brushos out for a play again. Great use of your snippets .. .. and a fabulous stamp for paper-piecing. Hope all is well with you and you are managing to keep warm. Our snow started yesterday and I think we may get some more today! !